I drove more than an hour round trip to the dentist today and listened to A Little History of Philosophy by Nigel Warburton on the way. At the same time I was drinking in the information all my senses were sending me, especially the visual. Glory! I stopped on the way home to take pictures, in the only spot that gave me room to pull over, and where there happened to be some fava beans growing in the field, maybe “drop-ins” (as my Syrian neighbor used to call volunteers) left over from a long-ago planting. I was sad to hear on the recording about Pyrrho of Elis (c. 360–270 BC) and how, according to this admittedly simplified and somewhat satiric introduction, he constantly doubted his senses and intuitions and even what common knowledge had been handed down through the ages. He focused on man’s inability to know anything for sure. Many funny legends — such as, his friends had to protect him from falling off cliffs, etc, because he couldn’t trust what his eyes were telling him, that he was on the cliff’s edge — are told about Pyrrho, who wrote nothing and probably was not as crazy as his Skeptic philosophy might have made him if carried to extremes. As I was looking at the poppies and the green fields, the cows and blue sky and the clouds, yes, I was certain that I was not hallucinating. That was truly deep green clover and a purple flower. And I knew that God meant for me to receive all these gifts from nature and the Creator without doubting everything at the outset. We should protect our children from the skeptical mind which does pervade modern society in more subtle ways, so that their natural human receptivity to the world and inclination to believe are not deadened. The best way to guard their minds against error is not to teach them to doubt, but to nurture them in beauty and truth. Raj in the California atmosphere. The highlight of our Thanksgiving season was a visit from Kate and family, including that baby I met back in January, who came from India this month for various family get-togethers and his baptism. Glory to God! He and Kate and Tom did land first in Colorado to meet our newly relocated clan family, a few days after I’d come back here. So I wasn’t present when Raj encountered snow. Two days after my return, my part of the state was inundated with smoke and ash from the Butte County Camp Fire far to the north, and the day of Raj’s baptism far to the south I was not physically present. My friend and I were here in what looked for a few days like a thrift store, organizing donations to the fire victims. Myriah did not lose her house, but she did certainly lose her home. As soon as Myriah drove on to the disaster area with lots of sweaters and socks and new coats, the Glad Group began trickling in, starting with Pearl’s family from Wisconsin and San Diego, and continuing with Raj and his parents, then Pippin’s people from northern California. Everyone wanted to meet Raj! And of course, to see his parents whom they’d been missing for a year and a half. Until Wednesday, the smoky and cold air had continued to hang over our county oppressively. Then RAIN, glorious and cleansing, fell from the skies, and overnight the Air Quality Index fell from the 160’s (similar to what I experienced in Mumbai last winter) to below 20. All day Pearl and I baked pies, and yams in orange sauce, and prepped the turkey dressing. With the rain came milder temperatures overall, so we had to leave the door and windows open at times to vent all the oven and stovetop heat, and for two days we had the comforting background music of steady pattering and drumming. Pearl took lambs’ ears and dodonea from my garden to add to spider mums from Costco and created table decorations for the feast. I had braved the smoke one day, wanting so much to get Pippin apples for pies, and drove a half hour to our favorite apple ranch where they still had stock of four varieties. I brought home Pippins, Romes, and Pink Ladies. It is still a sadly nostalgic thing for me to go there alone, but I am trying to embrace the joy of having such a rare and wonderful farm to go to, where I can find two or three dozen different varieties of apples over the course of the season. It makes me want to embrace and cherish apples more actively, too! I looked and looked online to find a recipe for pumpkin-chocolate-chip muffins, the hankering for which had come over me when thinking of how to get ready for my crowd. I discovered just in time that I had my own “best” recipe right here on my blog. It made a generous batch, enough for everyone to enjoy while waiting for the primary offerings of the feast. When the rain stopped briefly we looked at the newly-washed and radiant garden, and breathed in those scents that are like an autumn feast in themselves. A whole flock of bluebirds visited the fountain for baths and we wondered if they were washing off soot. My fava beans that sprouted when I was in Colorado are doing great. I cut a butternut squash down from the trellis to roast for soup, and Ivy found giant fruits on the arbutus (Strawberry Tree). After everyone had arrived, the “usual” fun began. This time, I think the unique circumstances of my recent sojourn in Colorado, followed by the fire and smoke, followed by the rain that kept me from walking, all contributed to lack of sleep, so that I felt alternately flat and in a hole — maybe in a flat-bottomed hole? — for days. But I did manage to take a few pictures, so now in recovery I have the vision to see them as a cohesive expression of a moment in our Glad cultural history. The Usual included wrestling and snuggling and staying-up-too-late-talking with brothers, daughters, aunts and uncles, and all the assorted kinfolk that one only sees once or twice a year anymore. Oh, it is hard being scattered over the continent and globe! I didn’t have it in me to go with everyone to San Francisco, the aquarium etc. at the Academy of Sciences on Saturday, and to Fort Point, so the smiling picture of Raj I also stole. But Sunday after church Kate’s and Pippin’s families and I did go to the redwoods! It was a dreamy time to go, almost winter and after several steady downpours had removed every trace of dust from the big trees, and both Pippin and the Professor helped me in my ongoing botanical studies. I learned that the lichens that hang from the trees like tresses are lichen fruticose, and that the needles in the tops of the coast redwoods (Sequoia sempervirens) resemble those of their cousins the giant redwoods (Sequoiadendron giganteum) that grow naturally in the Sierra Nevada. Big leaf maple and hazelnut trees made splashes of light and color in the groves that were dark in midday, the close canopy blocking the light from way up there. We made little impact on the deep quiet of the woods, strolling on the duffy paths — but that atmosphere was broken by a big crash and boom, the sound of a tree falling somewhere in the park. If everything hadn’t been thoroughly wet, we’d surely have seen some dust raised by that event. When Raj was carried into my house last week and met the third or fourth new crowd of relatives in a fortnight, he did respond to my face and voice with a sweet smile. Perhaps the FaceTime sessions truly did help him to remember my voice, adding to whatever deeper memories were embedded from those newborn lullaby sessions with me nine months ago. Now Pearl’s and Pippin’s families have departed, but Tom, Kate, and Baby Raj will be with me for a few more special days. A good rest and a forest walk have perked me up quite a bit, so I have hope of making the most of the rest of this week and entering into the joyful work and celebrations ahead. but Thine angel spread his wings over my cradle to defend me. have been marvelously showered upon me. who call upon Thy name. Thou hast brought me into life as into an enchanted paradise. where in the azure heights the birds are singing. and the melodious music of the streams. We have tasted fruit of vine and the sweet-scented honey. We can live very well on Thine earth. It is a pleasure to be Thy guest. Counting my dear sons’ wives, which I very thankfully do, I now have five daughters. It’s sad to think how I spent several years complaining that I didn’t birth more children; during that time I never anticipated the familial wealth that in-laws can bring. In an effort to enjoy our family friendships we women spent a few months planning our first mother-daughter holiday. When continents stretch between, the grandchildren have pressing needs, and the young women pressing schedules, so it’s a tribute to our devotion that we even tried. In the end, only half of us, two daughters and I, were able to get together recently, on California’s Central Coast. Pacific Grove was our home base. Every morning I woke with the feel of long-ago visits to my Aunt Margaret, whom I knew mostly in my teens. She lived in Carmel in a cream-colored house with white carpets, under a sky that was often white with fog or overcast, and the mood was so quiet. The sort of quiet that is filled with the sound of surf and the cry of sea gulls. Our gathering of last week was a quiet group, too, in spite of our much talking, which I imagine was still on the low end of charts that might be made of all-women excursions, as we often stood in silent wonderment over our surroundings. In our Keen boots — really, no one one had coordinated our foot attire, contrary to all appearances — we walked a lot, up and down the hills of Pacific Grove and Monterey and Carmel-by-the-Sea. And we looked at flowers and trees and birds and tried to identify them all. On Point Lobos especially the sweet smell of ceanothus blooms was filling the air, along with the buzzing of bees who were crazy over it. We liked the challenge of photographing busy bees. They liked how the pollen was offering itself to them on vast fields of stamens. Lucky for us that Mrs. Bread showed us a Protea in her garden our first afternoon, so that we could guess their identities when we kept seeing them everywhere from then on. The genus includes a huge variety of forms that are really striking. I came home to find that our bottlebrush tree is not a Protea, however. Proteas seem to have come originally from the southern hemisphere, but they definitely like growing on this patch of the globe. Behind Cannery Row murals have been painted along the bike path, evoking the culture and history that John Steinbeck depicted in his books. I liked browsing this lane better than the touristy shops which carry, as Joy pointed out, all the same stuff from China that touristy shops all over the nation carry. Oh, except maybe the otter dolls. I was expending so much mental energy drumming up buyer’s resistance that I didn’t even think about how I could have taken a picture of one. There were three stuffed toy versions of the captivating creatures that we watched lolling and playing in Monterey Bay, and I can’t find one online that is as cute, to post here. While in Monterey it was quite fun to revisit the Cooper-Molera House so soon after our last visit, but long enough that the plants were further along in spring, as this fava bean plant with its black-and-white blossoms. There were even little bean pods forming lower on the plant. Pacific Grove is called Butterfly Town, because of the Monarch butterflies that migrate there every year. I’ve long had a vicarious and romantic attachment to the place thanks to the book by Leo Politi, and now it has become a direct relationship with the same feelings. The weather we experienced was surprisingly mild in spite of frequent short showers of drizzle or light rain — but I might find it difficult to stay long where the sun doesn’t show itself often enough to keep the spirits up. Flowers seem to glow more vividly under grey skies, though, and that makes up for the drear a little bit. People paint their houses in cheerful colors. And peace and quiet count for a lot. The Pacific Ocean is not always peaceful, but it was fairly calm this week. The tsunami from Japan didn’t make a big wave here. You can’t see them, but two otters are playing in this picture. And peace and serenity and love were all playing some quiet music in our hearts. It was a bit of a drive this morning, to get to the spring organic plant sale at an “ecology center” I’d never visited before. My main reason for going was to get tomato plants that are grown and tested in a place that is of a similar climate to us; I don’t want another Pitiful Tomato Summer. Oh, our tri-color cherry tomatoes saved us last year, but all the space and attention we gave to the regular tomatoes was not equal to the reward. I was a little puzzled as to why they were having their sale so early; we never plant tomatoes until the first of May. But I thought I could just keep the plants under cover for another couple of weeks. As it turns out, I won’t have to do that, because when I arrived at the sale right after it started at 9 a.m., I couldn’t find what should have been a giant collection of tomato plants. “We will sell those at our next sale, May 1st,” a staff person told me. Aha! I hadn’t nosed around long enough on the website to learn all I needed to know. My trip was not for nought, however. I’m glad for my error; otherwise I wouldn’t have bothered going there. I’d have missed the lovely drive under clouds, along fields spotted with Spanish Broom. This plant always reminds me of a time when Pippin was a toddler and I’d pack her on the back of my bicycle in the mornings to ride for a few miles along banks of broom in bloom, our heads filling with the sweet scent as we breezed by. 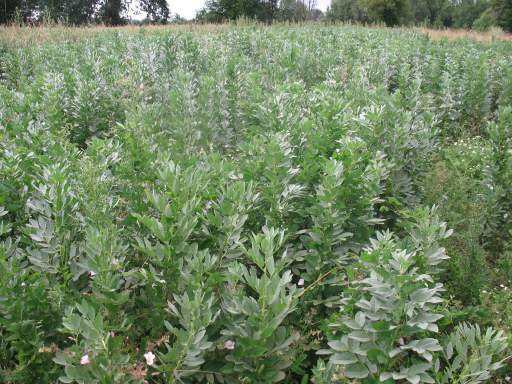 Today I also saw one of the remaining fields of fava beans. I love how these grow almost secretly all winter, and then when we emerge from our winter dens they are already tall and robust. Along with asparagus and artichokes, they used to keep my former (bigger) garden busy until we were ready to plant more tender things. I forgot to take my camera, so I found the fava pic on the Internet. Even though there were no tomatoes, I found several enticing items to spend my money on, what with so many healthy looking young specimens spread out on tables under trees. 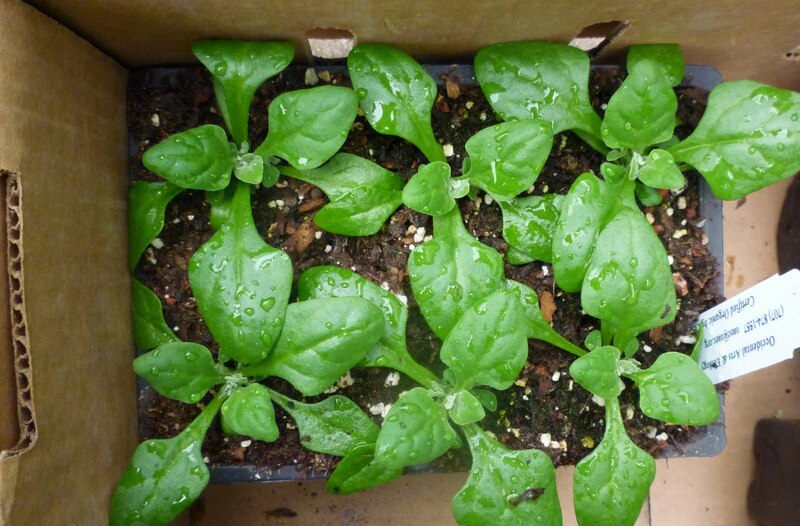 As long as we’ve lived in our current place, I have been unsuccessful at growing New Zealand Spinach from seed. Though it’s not a true spinach, I really appreciated it in the past for the way it grows all the hot summer long and is handy to toss into any dish where you want the flavor of spinach. As I recall, I mostly used it in Creamy Green Soup, a Laurel’s Kitchen cookbook recipe. My gardener-heart rejoiced to see a six-pack of my old friends, so I snatched that up first thing. 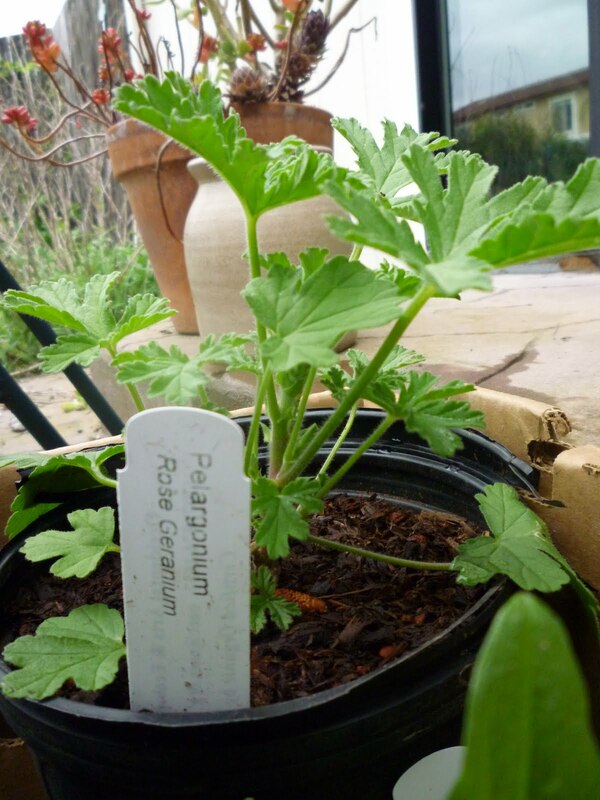 After a friend gave me a cutting once, I had rose geraniums propagating all over the yard for several years. But they had all died; I brought this one home to parent a new generation. I bought some bachelor’s buttons, which I don’t recall growing before, and a Hummingbird Sage, which I might plant at church instead of home. And three little pots each holding a different type of flat-leafed parsley! In the picture you can see a fourth little pot on the left, of Copper Fennel. Don’t know what I’ll do with that, other than chew on the feathery leaves if there are enough of them. 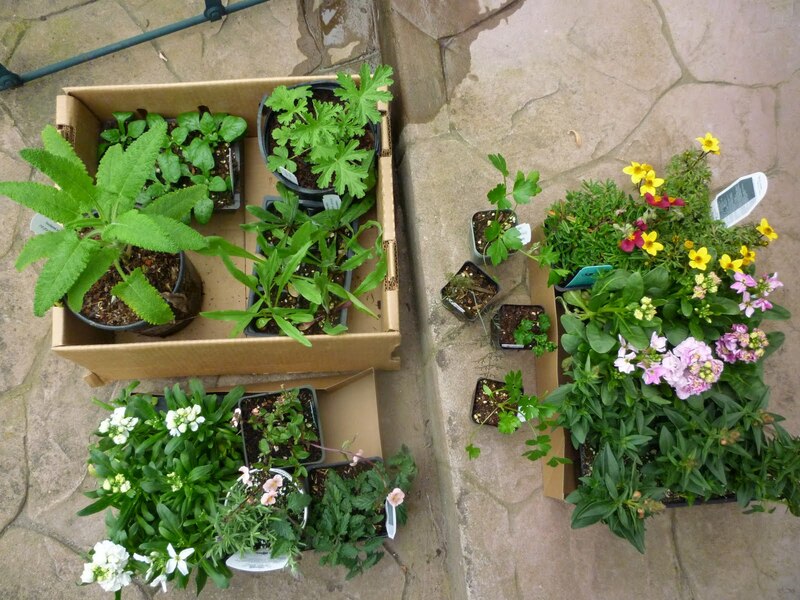 To get back to my car, I had to hike up a steep hill, carrying my box of plants. That was a good thing; I knew at the outset not to choose too big a box, or I’d have to make two trips. Close to the plant sale is a nursery that I don’t get to very often, so I had to stop in there, to see if they had snapdragons and stock in the colors I wanted. They did! And they had several other things that begged to go with me, which I was kind enough to arrange. When I got home I took a picture of the whole caboodle. Oh, but that was after I stopped at another nursery closer by, just to see if they had any taller snapdragons yet, which they didn’t. Rain was beginning to fall, so I decided to just go home and write my report on my morning. I’ve been up since Mr. Glad’s alarm went off at 5:20, and before I went plant shopping I swam at the gym. So I’m almost worn out already. Yesterday my young church friend C. worked with me in the garden here for almost two hours, and it helped me tremendously to have a willing and diligent companion as I broke through the months-long growth of mammoth weeds. C. carried dozens of loads of pulled weeds to the garbage can, and cleared layers of pine needles from the path and off the cyclamen and manzanita. He never stopped moving, even while he told me all about his favorite books and movies, and about cartoon characters he has created. I’m going to try to have him at least twice a month, as a concession to my aging body that hurts and slows down when I abuse it by stooping, pulling, hauling and pruning for more than a couple of hours at a time. He might help me with housework, too. But this week we stuck to the garden and even planted some lilies.